A mission statement defines the fundamental purpose of an organization or enterprise. A mission statement is generated to retain consistency in overall strategy and to communicate core organizational goals to all stakeholders. The business’s owners and upper managers develop the mission statement and uphold it as a standard across the organization. It provides a strategic framework by which the organization is expected to abide. In a best-case scenario, an organization conducts internal and external assessments relative to the mission statement to ensure it is being upheld. A mission statement informs the key market, contribution, and distinction of an organization. It describes what the organization does, why it does so, and how it excels. mission: A set of tasks that fulfills a purpose or duty; an assignment set by an employer. stakeholder: A person or organization with a legitimate interest in a given situation, action, or enterprise. A mission statement defines the purpose of a company or organization. 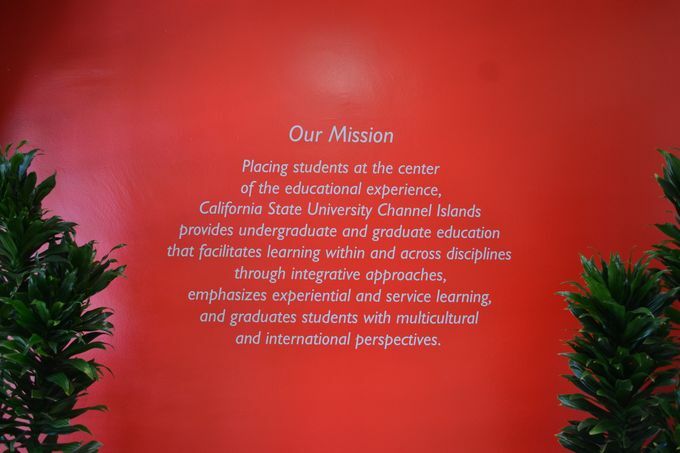 The mission statement guides the organization’s actions, spells out overall goals, and guides decision making. The mission statement is generated to retain consistency in overall strategy and to communicate core organizational goals to all stakeholders. The business’s owners and upper managers develop the mission statement and uphold it as a standard across the organization. It provides a strategic framework by which the organization is expected to abide. Mission statement: An example of a mission statement, which includes the organization’s aims and stakeholders and how it provides value to these stakeholders. In a best-case scenario, an organization conducts internal and external assessments relative to the mission statement. The internal assessment should focus on how members inside the organization interpret the mission statement. The external assessment, which includes the business’s stakeholders, is valuable since it offers a different perspective. Discrepancies between these two assessments can provide insight into the effectiveness of the organization’s mission statement. The organization’s primary stakeholders, including clients/customers, shareholders, congregation, etc. Contribution – What product or service do you provide to that client? Distinction – What makes your product or service so unique that the client would choose you? To be truly effective, an organizational mission statement must be assimilated into the organization’s culture (as the theory states). Leaders have the responsibility of communicating the vision regularly, creating narratives that illustrate the vision, acting as role-models by embodying the vision, creating short-term objectives compatible with the vision, and encouraging employees to craft their own personal vision that is compatible with the organization’s overall vision. Michael Porter classifies competitive strategies as cost leadership, differentiation, or market segmentation. Michael Porter defines three strategy types that can attain competitive advantage. These strategies are cost leadership, differentiation, and market segmentation (or focus). Cost leadership is about achieving scale economies and utilizing them to produce high volume at a low cost. Margins may be narrower, but quantity is larger, enabling high revenue streams. Differentiation is creating a unique service or product offering, either through good branding or strong internal skills. This strategy aims at offering something difficult to copy and is strongly associated with an organization ‘s brand. Market segmentation strategy is narrower in scope. Both cost leadership and differentiation are relatively broad in market scope and can encompass both strategic advantages on a smaller scale. Porter warns that companies who try to accomplish both cost leadership and differentiation may fall into the “hole in the middle”; he notes that specializing is the ideal strategic approach. competitive advantage: Something that places a company or a person above the competition. Market Share: Percentage of a specific market held by a company. Michael Porter described a category scheme consisting of three general types of strategies commonly used by businesses to achieve and maintain competitive advantage. These three strategies are defined along two dimensions: strategic scope and strategic strength. Strategic scope is a demand-side dimension and considers the size and composition of the market the business intends to target. Strategic strength is a supply-side dimension and looks at the strength or core competency of the firm. Porter identifies two competencies as most important: product differentiation and product cost (efficiency). He originally ranked each of the three dimensions (level of differentiation, relative product cost, and scope of target market) as either low, medium, or high and juxtaposed them in a three-dimensional matrix. That is, the category scheme was displayed as a 3x3x3 cube; however, most of the twenty-seven combinations were not viable. Cost leadership pertains to a firm’s ability to create economies of scale though extremely efficient operations that produce a large volume. Cost leaders include organizations like Procter & Gamble, Walmart, McDonald’s and other large firms generating a high volume of goods that are distributed at a relatively low cost (compared to the competition). Differentiation is less tangible and easily defined, yet still represents an extremely effective strategy when properly executed. Differentiation refers to a firm’s ability to create a good that is difficult to replicate, thereby fulfilling niche needs. This strategy can include creating a powerful brand image, which allows the organization to sell its products or services at a premium. Coach handbags are a good example of differentiation; the company’s margins are high due to the markup on each bag (which mostly covers marketing costs, not production). 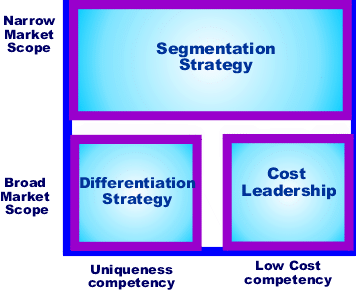 Market segmentation is narrow in scope (both cost leadership and differentiation are relatively broad in scope) and is a cross between the two strategies. Segmentation targets finding specific segments of the market which are not otherwise tapped by larger firms. Porter’s competitive strategies: Porter’s three strategies can be defined along two dimensions: strategic scope and strategic strength. Empirical research on the profit impact of marketing strategy indicates that firms with a high market share are often quite profitable, but so are many firms with low market share. The least profitable firms are those with moderate market share. This is sometimes referred to as the “hole-in-the-middle” problem. Porter explains that firms with high market share are successful because they pursue a cost-leadership strategy, and firms with low market share are successful because they employ market segmentation or differentiation to focus on a small but profitable market niche. Firms in the middle are less profitable because of the lack of a viable generic strategy. A SWOT analysis allows businesses to assess internal strengths and weaknesses in relation to external opportunities and threats. SWOT analysis is a strategic planning method used to evaluate a business’s strengths, weaknesses, opportunities, and threats. The goal of a SWOT analysis is to analyze the business environment to develop a strategic plan of action that captures opportunities using internal strengths (and avoids threats while addressing weaknesses). Businesses set objectives after the SWOT analysis has been performed, which allows the organization to define achievable goals. environment: The surroundings of, and influences on, a particular item of interest. A method of analyzing the environment in which businesses operate is referred to as a context analysis. One of the most recognized of these is the SWOT (strengths, weaknesses, opportunities, and threats) analysis. Performing a SWOT analysis allows a business to gain insights into its internal strengths and weaknesses and to relate these insights to the external opportunities and threats posed by the marketplace in which the business operates. The main goal of a context analysis, SWOT or otherwise, is to analyze the business environment in order to develop a strategic plan. SWOT analysis: The SWOT analysis matrix illustrates where the company’s strengths and weaknesses lie relative to factors in the market. Strengths and opportunities (the S and O of SWOT) are both helpful toward achieving company objectives, but strengths originate internally while opportunities originate externally. Similarly, weaknesses and threats (the W and T of SWOT) are harmful toward achieving objectives, but weaknesses originate internally and threats originate externally. Assessing all four points of the SWOT acronym ensures a thorough evaluation. A SWOT analysis is a strategic planning method used to evaluate the strengths, weaknesses, opportunities, and threats related to a project or business venture. A SWOT assessment involves specifying the business’s objective and then identifying the internal and external factors that are favorable and unfavorable toward the business’s ability to achieve its objective. Setting the objective, in terms of moving from strategy planning to strategy implementation, should be done after the SWOT analysis has been performed. Doing so allows the organization to set achievable goals and objectives. Identifying SWOTs is essential, as subsequent stages of planning can be derived from the analysis. Decision makers first determine whether an objective is attainable, given the SWOTs. If the objective is not attainable, a different objective must be selected, and then the process can be repeated. Users of SWOT analysis must ask and answer questions that generate meaningful information for each category to maximize the benefits of the evaluation and identify the organization’s competitive advantages. Forecasting is the process of making statements about expected future events, based upon evidence, research, and experience. An important aspect of forecasting is the relationship it holds with planning. Forecasting can be described as predicting what the future will look like, whereas planning predicts what the future should look like. As part of the implementation of policies and strategies, the forecasting method develops a reliable picture of the company’s expected future environment. Quantitative forecasting generally employs statistical confidence intervals and historical data to project potential future trends that are based upon the criteria being analyzed. Qualitative approaches are the opposite: they rely on logical premises, expertise, or past experience to generate estimates of future circumstances. Forecasting enables a manager to look at the current environment and identify likely scenarios, each of which may require a deviation from the overall strategy. scenario: An outline or model of an expected or supposed sequence of events. planning: The act of formulating a course of action or of drawing up plans. Forecasting is the process of making statements about expected future events based upon evidence, research, and experience. For example, a business might estimate the exchange rate between the U.S. and the EU one year from now to determine the real financial cost of a project. An important and often overlooked aspect of forecasting is the relationship it holds with planning. Forecasting can be described as predicting what the future will look like, whereas planning predicts what the future should look like. While both are managerial functions, forecasting is rife with external uncertainty while planning is hindered by internal uncertainty. Forecasting can be accomplished in a variety of different ways, some more statistically reliable than others. Following are a few critical points of differentiation and specific strategies to keep in mind when forecasting. One of the simplest points of differentiation between methods is the reliance on numbers for accuracy. Quantitative forecasting generally uses statistical confidence intervals and historical data to project potential future trends that are based upon the criteria being analyzed. In this format, results are expressed in certainty intervals (i.e., how confident can we be that this will be the case?) and often rely on financial data (exchange rates, industry growth, etc.). Qualitative approaches are the opposite; they rely on logical premises or past experience to generate estimates about future circumstances. The inherent problem with the qualitative approach is simple: subjectivity. While quantitative measure use data to express objective results, qualitative approaches do not have this luxury. Generally this type of forecast will include the opinions of experts, upper management, and market research. Quantitative vs. qualitative forecasting: This flow chart compares quantitative and qualitative forecasting methods. Qualitative forecasting relies more on opinions than data and can employ market research, sales-force input, or a jury of executives. In contrast, quantitative forecasting relies more on objective, numerical data, and can look at chronological trends and statistical regression to infer cause-and-effect. Another method of forecasting, which is likely to be both quantitative and qualitative, is the causal/econometric approach. This strategy tasks managers with identifying cause and effect relationships of past instances by defining a series of if/then statements that express the likelihood of the outcome which follows. For example, if consumer spending is down in Q2, then it is likely that gross domestic product (GDP) growth will be down in Q3. Whether or not this is true would have to be supported with data, but the forecast is that Q2 consumer spending results could forecast Q3 GDP growth. Keeping these methods in mind, it is important to understand how management uses these forecasts to draw conclusions. Forecasting plays a role in the implementation of policies and strategies. The practice helps businesses create plans for different situations, in addition to contingency plans for adapting if and when necessary. Forecasting enables a manager to look at the current environment and identify likely scenarios, each of which may require a deviation from the overall strategy. As the management team implements the broader strategy, it must continuously monitor the current environment for deviations and use forecasting to adapt both the primary strategy and contingency plans for potential shifts. To summarize, forecasts enable businesses to prepare new strategies or reinforce the existing strategy, based upon the projections made. In the resource-based view (RBV), strategic planning uses organizational resources to generate a viable strategy. Strategic approaches are wide and varied, and the resource-based view is a commonly cited strategic approach to attaining competitive advantage. To transform a short-run competitive advantage into a sustained competitive advantage requires that these resources be varied in nature and not perfectly mobile. They also must not be easily imitated or substituted without great effort. The RBV theory involves first identifying the firm’s potential key resources and deriving a strategy to apply them to create synergy. If key resources are valuable, rare, inimitable, and non-substitutable (VRIN), they may enable a strategy for achieving competitive advantage. heterogeneous: Diverse in kind or nature; composed of diverse parts. imitable: Capable of being copied. substitutable: Capable of being replaced. The resource-based view (RBV) of strategy holds company assets as the primary input for overall strategic planning, emphasizing the way in which competitive advantage can be derived via rare resource combinations. To transform a short-run competitive advantage into a sustained competitive advantage requires that these resources are heterogeneous in nature and not perfectly mobile. Effectively, this principle translates into valuable resources that are cannot be either imitated or substituted without great effort. If the firm’s strategy emphasizes and accomplishes this goal, its resources can help it sustain above-average returns. In many ways, business strategy aims to achieve competitive advantage through the proper use of organizational resources. As a result, the resource-based view offers some insight as to what defines strategic resources and furthermore what enables them to generate above-average returns (profit). Upper management must carefully consider what resources are at the company’s disposal and how these assets may equate to operational value through strategic processes. A company should care for and protect resources that possess these characteristics, because doing so can improve organizational performance. The VRIN characteristics mentioned are individually necessary, but each is insufficient on its own to sustain competitive advantage. Within the framework of the RBV, the chain is as strong as its weakest link, and therefore requires the resource to display each of the four characteristics to be a viable strategy for competitive advantage. 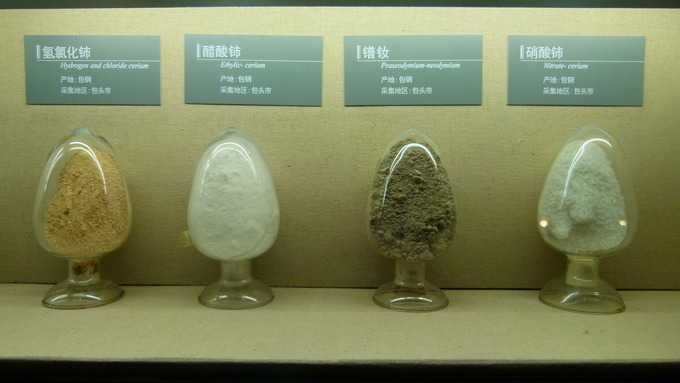 Example of VRIN resources: Rare earth elements satisfy the requirements of being VRIN, in that they are valuable, rare, largely inimitable due to few extraction sites, and difficult to substitute.